We cannot save ourselves, we require grace. Grace is freely given, unearned and unmerited. By God’s grace we are saved. Grace requires faith, for we cannot receive what we do not believe. But Paul tells us even faith comes from God. God gifts us with faith. Again we have to be open to receive what God offers, if we reject God’s faith than God will not force it upon us. God’s love and mercy is free and we choose what to receive. To be sure we understand Paul specifically states it does not come from our works. Imagine a fragile baby born many months too soon, after a struggle it dies. Thanks to God’s grace this baby is offered salvation. The person in an accident who has lost use of all body function, can be offered salvation through grace. The person with down-syndrome who offers nothing but love and relationship is no better off than the person who is a loner. God’s grace is the same for all. 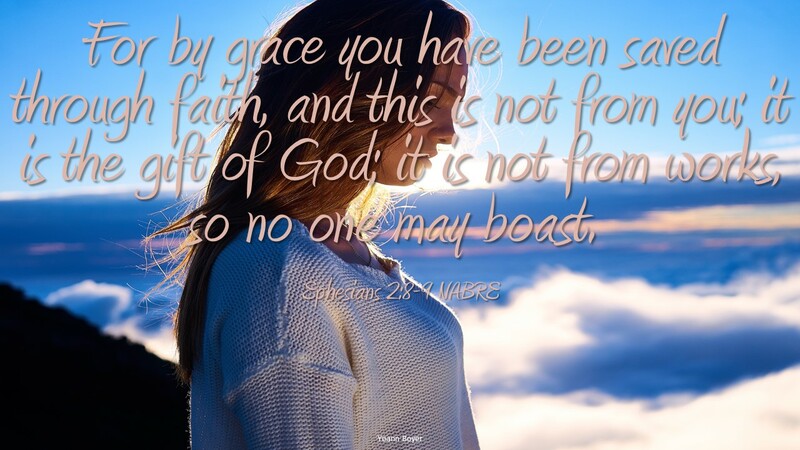 Paul says we are saved by grace so that we cannot boast. It is human nature to boast, we might say “I am saved because I brought a million souls to salvation.” In fact none of this is true, this work cannot save nor can we bring a soul to salvation, it is only God’s grace. Then why do works? Well there is reward after salvation. Jesus tells his disciples he is preparing a place for them, a mansion. (John 14:3) Paul writes, “For we must all appear before the judgment seat of Christ, so that each one may receive recompense, according to what he did in the body, whether good or evil.” (2 Corinthians 5:10). So we still want good works, but it is only grace that saves. Do you see everything you have as gift from God? Can you do good works and still not be saved?